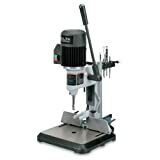 If you are even remotely serious about your woodworking you will definitely need one of these DELTA 32-325 3/4-Horsepower 13-Spindle Line Boring Machine’s. Gone are the days of creating adjustable shelving with a 3/16 drill bit and some peg board! With one pull of the handle you have 13 perfectly aligned and sized shelf pin holes for your projects and Delta really has no competition at this price point. I have had my machine for 10 years. We use it daily and it has never failed us. Never! 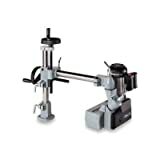 Easy to set up and operate, the Delta 14-651 1/2-Horsepower Mortiser is specially designed for the professional user and includes a multi-position hand lever and rotating mortising head for tricky off-table projects. Capable of punching smooth mortises in a range of stock–including hardwoods–this professional bench mortising machine is a must-have addition to any shop. .. The DELTA 36-850 1/4 HP 4-Speed 3-Roller Stock Feeder is designed with a single-phase 115-volt reversing motor and three spring-loaded rubber feed rollers for maximum efficiency. A lubricated gear box works in tandem with the continuous duty motor to transmit power to the feed rollers, ensuring smooth feeding of all material types. Four speeds match your desired pace to suit your unique feeding jo.. Heavy duty cast iron construction with a heavy duty trunion assembly supporting the Table. Powerful 1/2 HP, 120V motor for long lasting, smooth operation. Convenient top-mounted manual brake stops the sanding disc in seconds. Cast iron table tilts left and right with positive stops at 22.5, 45 and 90-Degrees and locks in place with one dual purpose lock and bevel table adjustment handle. Superio..